This is a wonderful cause that I was so happy to be able to contribute to. Its amazing to read through your chronicle of reaching this goal! 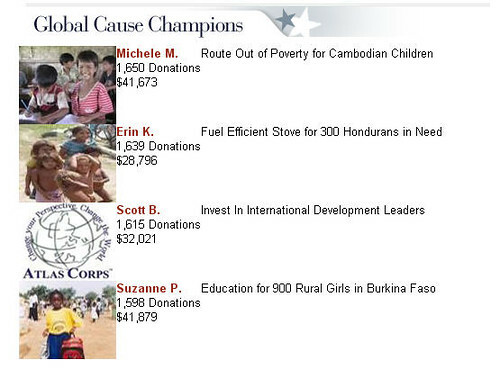 Social Fundraising at its finest... truly remarkable :-) Congrats Beth & Michele! Congratulations! I loved being a small part of this campaign -- it taught me a lot about online fundraising and the power of networks and small donations. And for a great cause! Beth, as I've said several times before, this is a huge testament to your energy, enthusiasm and hard work, as well as to the incredible power of the social web. Congratulations! congratulations! :) i know you worked so hard on this. Congrats to you all for your efforts. It's inspiring and offers me hope that there are caring, loving people out there who just want to help. Social fundraising is a wonderful idea. Here's to much success to you and your team! I will blog about your cause to help spread the word too! Congratulations, Beth. You have taught us all a lesson about the power of social media and electronic distribution of communication of targeted needs and how individuals can do small acts of kindness that in turn can influence great results. congratulations Beth and the wondeerful team! you guyz are an inspiration for everyone and we all believe 1000% in your work! Beth, you are really great at this. Mazal Tov yet again on a job well done. This whole competition thing has been a good model for your strengths, and I have given to this worthy cause every time you asked. But I wonder about all the orgs who went down this road because of the publicity but were so less equipped than you to be successful. I saw lots of questions about this on the PX list and elsewhere and thought to myself, these poor suckers, they are going to spend lots of time putting this together, will get little response, and people like Beth -- with big and active networks -- will eat their lunch. They don't have a chance. I also wonder if this whole competition thing is sustainable. How many of these could you do before you create fatigue in your network? And, is there a way to get the folks who gave with the urgency of this campaign to have a deeper engagement with the Sharing Foundation? Would love your thoughts on all of this in another post. Woohoo! Congratulations, Beth. Such an awesome success story and so much good for your cause. Rock on! Awesome job, Beth! Great example of how things like this can be done using social media. Congratulations. Great news :) A powerful example of personal and networked fundraising. Thanks you everyone for joining making such an effort happens. Hopefully, Cambodian children will be in good shape in fighting poverty.